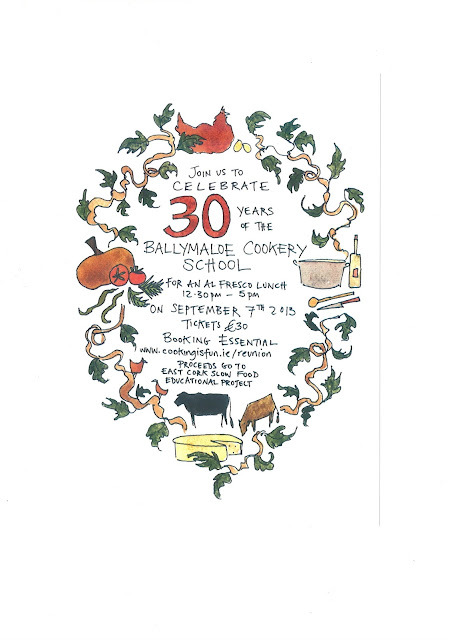 To celebrate 30 years of the Ballymaloe Cookery School we're planning a big bash! A huge gathering of past 12 Week students and teachers. We're also hoping to invite many of the guest chefs who have inspired us throughout the years. We'll have a celebratory lunch with food from the farm, gardens, local artisans and farmhouse cheesemakers. Flavours to remind you of this place and a blast from the past. Invitations have already gone out, some by email and some by snail mail, but we're still concerned that there are a number of past students who have changed address, or even country, that we haven't been able to contact. So if you're a past 12 Week Certificate Course student, or know someone who was, please be assured that we haven't left you out, it's just we haven't been able to reach you! Please do get in contact with us! It's on Saturday 7th September and we'd love to have you here! In the US something very interesting is happening, it’s virtually a grass roots revolution. However, it’s not just in the US, in cities all over the world people seem to feel a deep need to produce food locally once again. It seems to be an international phenomenon - an eerie almost primeval reaction as if deep down people sense that there may be a shortage of food before too long. 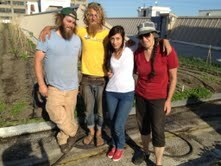 In fact, rooftop farming including backyard chickens and rooftop apiaries are now a major international urban trend. 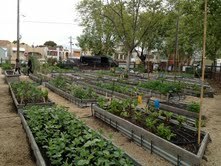 From Detroit to Tokyo, Rotterdam to Hong Kong, Montreal to Brooklyn, there are urban farming projects. I first noticed the guerrilla garden movement on a visit to San Francisco about five years ago. Virtually every patch of waste ground or disused parking lot had been commandeered by eager gardeners who planted vegetables, herbs and salad leaves. Some shared their surplus with local shelters and sold the remainder from farm stands on the edge of the plot. Since then I have visited numerous projects particularly in the US. From the Edible Schoolyard in Berkeley and the City Slicker Community Farms in Oakland California, to a two acre farm in the centre of Austin, Texas. Some projects are one man bands, others community based. 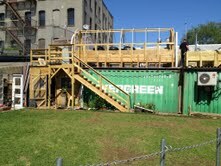 Recently, I went to New York to check out the urban farming movement. For the first time I began to get idea of the sheer scale, there are over 700 urban farms and gardens across New York City alone. Last year, I visited Brooklyn Grange a two acre rooftop farm on top of a five story building on Northern Boulevard, New York, established in May 2010. 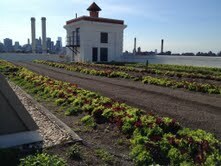 On a recent trip, I looked at a couple of other models, a branch of Brooklyn Grange at the Navy Yard, 65,000 square feet of vegetable beds on the top of an eleven story building. This project provides a livelihood for four people, employment for a further ten people and 30 apprentices plus a refugee training program. They sell their fresh produce from a farm stand outside the building and also have a CSA (Community Supported Agriculture) and make lots of jams, pickles, hot sauces and herb teas from the surpluses and gluts from the farm. Anastasia Cole Plakias showed me around and explained how nowadays there is growing support at government level for initiatives that are helping to change the food system plus deliver environmental benefits. Hurricane Sandy really spooked New Yorkers particularly those in lower Manhattan and Brooklyn, some of whom were without power and water for over a week. So any initiative that contributes to storm water management (a buzz word) is welcomed and generously supported. Anastasia explained that the Navy Yard got a generous SARE (Sustainable Agriculture, Research and Education) grant from Mayor Bloomberg and Department of the Environmental Protection who see it as more efficient to invest in green roofs and infrastructure which creates jobs and has several extra benefits. Roof top farms and green roofs not only utilise space that would otherwise be empty and unused but they absorb rain and storm water run-off that would eventually end up polluting the East River. They also absorb heat during the day and release it into the atmosphere at night plus decrease the heating and cooling needs of a building. 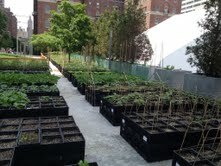 The Nave Yard Project also links up with GrowNYC on a composting program. 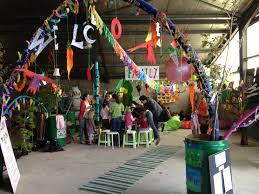 Local residents collect their organic waste which when composted enriches the fertility of the soil, which is the biggest challenge for rooftop farms. The Edible Schoolyard started by Alice Waters in Berkeley in California now has a branch in Brooklyn which partners with schools to build gardens and kitchen classrooms where children can engage in hands-on learning. They aim to provide students with the knowledge and skills and environment required to healthier choices and change the way they eat for life. Top chefs are also frantically growing their own produce and linking in with local projects but there is a whole other article in that of which more anon. I can't believe I'm queuing in the rain with another hundred plus people to buy a ‘cronut’ at Dominique Ansel bakery in Spring Street in New York. This cronut which has been sending New Yorkers into a frenzy is a hybrid of a deep-fried croissant and doughnut. It is 7. 35am and it's pelting rain. Beside me there is a Japanese lady from Boston and a chap from UBS who has just come off a night shift, the line now stretches all along Sullivan Street, and it’s made up of mostly young people, hipster types - “They'll be onto something new next week - that’s New York for you, everyone’s looking out for the next big thing,” says the cool lycra clad girl in a baseball hat beside me. She 'in wine' and has run from the other side of Central Park but her work doesn’t start till 11.30. At the edge of the side walk a white van from the Avon Foundation for Women, emblazoned with “God’s Love We Deliver” is collecting food parcels to deliver to the needy. The irony is not lost on us, here are we standing in line for extra calories we don't need! The sleepy guy beside me tells me he's a student doing an MBA in business and he's only doing this because he's in the ‘dog house’ with his girlfriend, he’s hoping to get two cronuts as a surprise for her, I don't like to ask why. Some people are playing on their phones others are swapping “how crazy am I” stories. Some enterprising dudes have been queuing in line since 6am to buy the allocated two ‘cronuts’ per person, then they plan to sell the five dollar pastries for 20 dollars each to supplement their welfare, it's mad. Dominique Ansel has trademarked the cronut, the demand is insane and so the challenge of copying it and coming up with a new name is exercising bakers all over New York and beyond. There are already some knock offs called ‘doissants’ and ‘croughnuts’. A TV camera has just passed along and there's a second, they are wanting to try to understand what the heck all the fuss is about, obviously a grey haired lady stands out from all the cool young things so they want to know why I'm there, when they hear I come from Ireland they are even more incredulous and want to know what flavour I'm queuing for, I didn't even know there were different flavours! At 8am the line starts to move around the corner, the door of the bakery on Spring Street has obviously opened, and then it moves ever so slowly. It’s still pouring rain and everyone in the queue has bonded and are having convivial chats. It's now 8.15am and we are around the corner on to Spring Street. By now, passers-by going to work are bemused as they survey the long line. It’s after 8:30am we're up to the door, they let in about 15 people at a time and then we queue along the counter. There are lots of other options, little boxes of madeleines are cooked to order, burnished canelles are being turned out of their copper moulds, a woman baker is dipping long slim éclairs in coffee fondant icing, six or seven people are serving behind the counter and they haven’t taken a breath since 8am. At 9.20am the queue outside finishes but people are still coming in in dribs and drabs so the queue at the counter never ends, it's now quarter to 11 and there are still people in line, and of course disappointed because the ‘cronuts’ have been sold out since just before 9am but there are still lots of other beautiful patisserie to choose from. Two Japanese girls recording their magic cronut moment - there was a lot of this going on! I’ve been sitting at a little table by the window watching the action for several hours now; I ate my precious ‘cronut’ with a cup of coffee, it turned out to be a deep fried doughnut shaped ring tender yet light and crunchy, with a circle of lemon maple icing. It was definitely good but certainly on the sweet side, the DKA (Dominique's Kouign Amann) is also delicious. When I met Dominique he was so kind and gracious despite the queue of food writers and TV crews wanting a piece of him. The baker who has suddenly found himself the hottest thing on the Big Apple food scene seems shy and slightly shell shocked by all the attention. When he was 18 he landed a job at Fauchon in Paris, where he spent eight years and then went on to open all the bakeries for Fauchon around the world. He caught the attention of Daniel Boulud who invited him to New York. While he was pastry chef at Daniel they were awarded three Michelin stars and four stars in the New York Times. Just a year and half ago he started his own bakery on a small budget, in a tiny premises on Spring Street, and even painted the walls himself. When I enquired how the cronut came about, it was almost accidental – apparently he had been experimenting with various versions and when they got an A from their Health Inspector, he made this confection and celebrated with his staff. They loved it and thought it should be the new fun summer item. Someone posted a photo online, and it had 140,000 ‘likes’ within 24 hours – whoaaa! It’s all happening for Dominique Ansel at present, he was recently presented with a James Beard Award, well deserved. Apologies again for my long silence - apart from giving the Ballymaloe Cookery School my almost undivided attention after the busyiness of LitFest, over the past few months, in every spare moment, I have been working on my new book: 30 Years of The Ballymaloe Cookery School. What a mission! It's a month past deadline already, and still not finished! It's been a mixture of pleasure and pain, and a wonderful trip down memory lane. So much water has passed under the bridge in those almost 30 years since Ballymaloe Cookery School first opened its doors on 15th September 1983. The big challenge is to remember it all! For most of that time I was writing for the Irish Times and later for the Irish Examiner, so those articles have helped to jog my memory and are almost like a diary of the evolving food scene in Ireland and my travels, which as you can imagine, were always food related! Rosalie Dunne, now retired, was my PA for almost 24 of those years, and has graciously agreed to come back and help me with my research for the book. She's got an ace memory, and we've had so much fun together reminiscing as we work to put the pieces together. Of course it could be 30 volumes - but my long-suffering publisher Kyle Cathie, wishes I could just deliver one! The plan was to have it in the shops in time for the 30 years celebration in September... I'll keep you posted! The LitFest was such a blast - the whole event went into orbit! We'd been hoping for 2,500-3000 people over the weekend, but in the end over 8,000 people showed up. We were really lucky with the weather and the whole event took on a life of its own. 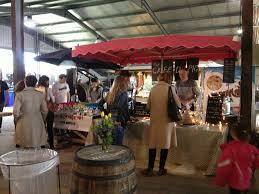 The Fringe in the Big Shed drew huge crowds wanting to soak up the festival atmosphere. We're still getting so much wonderful feedback ... and recovering... hence my silence! The speakers all loved the carefree Ballymaloe LitFest experience, being able to wander around and meet people and each other - many had never been to Ireland before.... but certainly plan to come back! We'd been tossing up about whether it would be an annual or biennial event, but as a result of the overwhelmingly positive feedback, we've decided to do it again next year! Plans are well underway, Ballymaloe already had a wedding booked over the May Bank Holiday Weekend - so we've opted the 16-18th May 2014 instead. Diana Kennedy from Mexico and Maggie Beer from Australia have already enthusiastically accepted an invitation to join us, as have Sami and Yotam from Ottolenghi. So pop the date in your diary and watch this space!